Recently refurbished to a good standard, this fantastic one bedroom ground floor flat boasts a large reception room, modern fitted kitchen and a central location for local amenities. 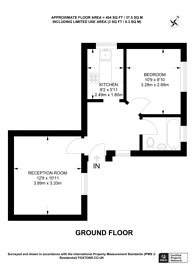 Well located for the local amenities and transport links from Anerley mainline station. The open expanse of Crystal Palace Park and South Norwood Cricket Grounds are nearby. Crossfit and personal training gym based in the heart of the Crystal Triangle. Always a hard workout. 406 (37 Sq M) approx.